Archmandrite Mardarije Uskoković was Administrator of the Serbian Orthodox Church presence in North America, 1917 − 1922, initially under the omoforion of the Russian Orthodox Church. As of 1922, the Serbian Orthodox Church established a diocese of the U.S.A and Canada, with St. Nikolaj Velimirović as first Bishop. Archimandrite Mardarije resumed his role as administrator in 1923, and became Bishop in 1925. He led the Serbian Orthodox Church in Canada and the USA with piety and dignity, through difficult times, until his death at the age of 46 in 1935. 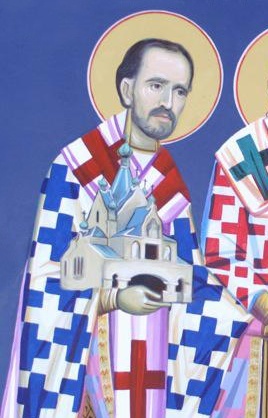 For his exemplary life, leadership and spiritual gifts left to us in North America, he has been added to the calendar of Serbian Orthodox Saints, as St. Mardarije of Libertyville, commemorated every December 12th. Holy Hierarch Father Mardarije, pray to God for us!